Organizers of the Tel Aviv seminar: Phil. Ambassador to Israel, Neal G. Imperial (center) with (from left) Third Secretary and Vice Consul Judy B. Razon, Ophir Tours Ltd Incentives and Events Manager Uri Shmueloff, Philippine Honorary Consul for Ashdod and Southern Israel Boaz Waksman, and Janndy Tours Inc. Director Dov Golan. The Philippines and Israel can anticipate higher tourism arrivals if recent promotional activities and collaborative efforts between the two countries pay off. During the seminar, the Embassy distributed brochures, posters, and official videos to attendees from 40 Israeli travel agencies. The materials presented the Philippines as a multi-destination country. Mr. Uri Shmueloff, the Incentives and Events manager of Ophir Tours, Ltd, which co-organized the seminar, introduced to the participants the natural treasures of the archipelago, including the powdery white sand beaches and remarkable UNESCO heritage sites. The wonderful attractions of Mt. Pinatubo, the Banaue Rice Terraces, Puerto Galera, and Boracay amazed them, too. 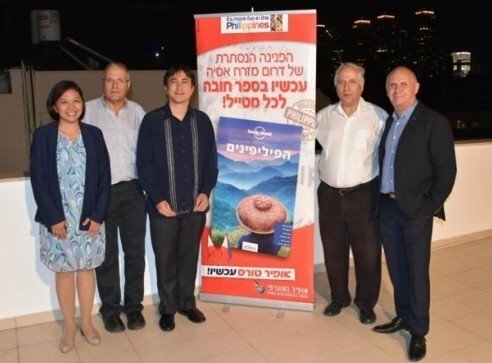 “The Philippines offers many destinations with an array of activities awaiting Israeli tourists,” Philippine Ambassador to Israel Neal Imperial also told the attendees. The seminar was a fitting follow-up to the Memorandum of Understanding (MOU) signed by Israel’s flag carrier EL AL Airlines and the Philippine Airlines (PAL) last month. The new MOU signifies deeper cooperation between Israel and the Philippines, and more visitors from either country. Mr. Jaime Bautista, President and Chief Operating Officer of PAL, and Mr. David Maimon, President and Chief Executive Officer of EL AL, signed the memorandum on September 20. It fortifies the Air Services Agreement signed in 2014, which made direct flights to and from each of the countries viable. The new MOU increases the number of flights between the two destinations. An article published in InterAksyon said tourist arrivals from Israel grew by 34 percent YoY in 2015, and 36 percent for the first six months of 2016. This puts Israel among the Philippines’ largest tourism markets in the Middle East. With the Philippine Embassy’s efforts to entice Israeli travelers and the recent MOU that paves the way for better air links between Israel and the Philippines, a sustainable tourism boom is expected from both countries in the years to come.